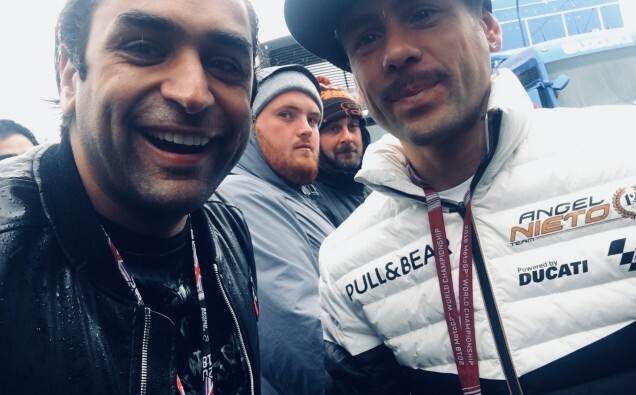 THE MotoGP British Grand Prix was cancelled after torrential rain caused “unsafe” track conditions at Silverstone but that didn’t stop presenter and actor Kiran Rai to talk and mingle with the bikers at backstage of Silverstone and even clap them at the finish line when on there practice run and was invited to be in the suite box and document the entire day! With heavy rain lashing down throughout the weekend, the MotoGP race had been brought forward from its original 10:00pm AEST start time to 8:30pm AEST in a bid to beat the weather. “We’ve had a number of years’ experience here in very wet conditions recently with the old surface and have been able to run races,” Webb said. “This year, with the new surface, is the first time we’ve encountered quite so much standing water in critical places on the track. So yes it’s a direct result of the track surface. “I am so sorry,” said Silverstone circuit managing director Stuart Pringle in a video statement on Sunday, promising to contact all ticket holders during the week. Four-time MotoGP world champion Marc Marquez, who leads the championship, added: “We are very sorry for all the fans, we are the first ones that want to ride but safety is the priority. “The Safety Commission analysed the situation and I think the Race Direction has to be thanked; they listened, and in the end, safety was everybody’s main consideration — one of us riders is in hospital already. Rabat, who had just crashed his Ducati in heavy rain, was walking away in the gravel at Stowe corner when he was hit by Italian Franco Morbidelli’s crashing bike.